Can you believe we are already half way through October? 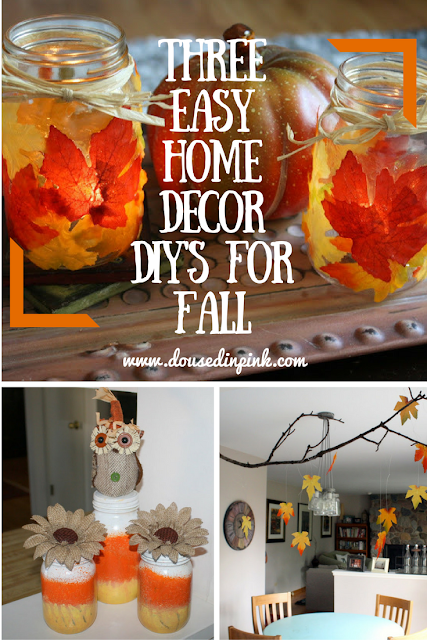 I've finally finished up my fall and Halloween decorations and will be sharing my fall home tour next week! For today, I have three cute and easy fall DIY's to share with you. Most of the supplies were purchased at Dollar Tree. I always go there first to see what they have before going to Hobby Lobby or Michael's. They usually have similar things and everything is only $1! Here we go! 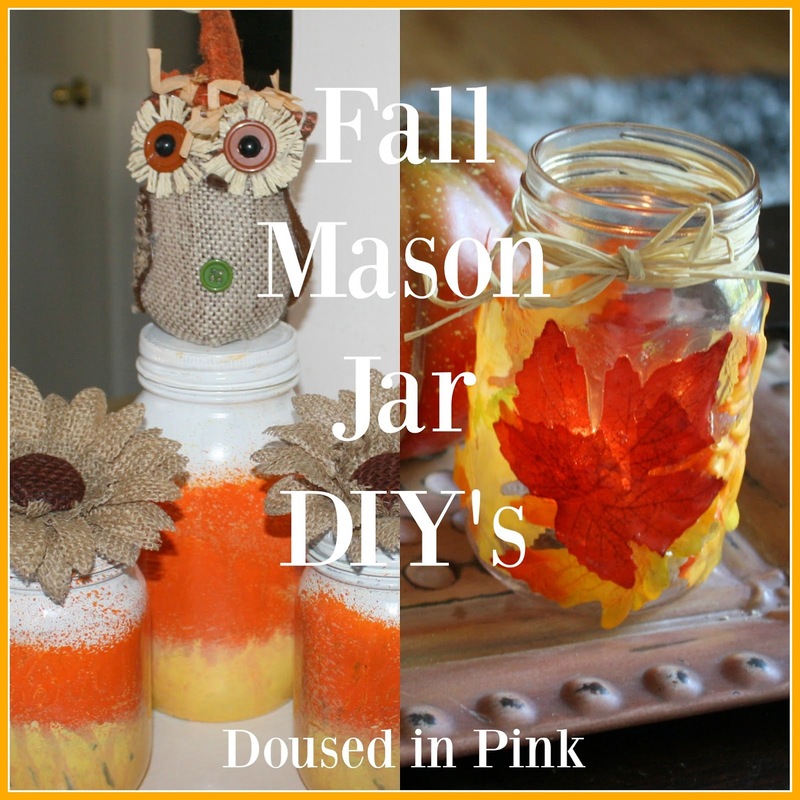 Lightly tape the the top and bottom of the jar and spray paint the middle with orange paint. Let dry and remove the tape. Spray the top of the jar with white paint and the bottom with yellow paint. Let dry. The paint may run together in spots but I think this gives it a more vintage feel. Use a glue gun to apply the decorations you choose to the lids. Display! Generously apply Mod Podge to 3/4 of the jar. Adhere leaves to the jar. Apply another layer of Mod Podge and apply more leaves. Let dry. Tie twine or raffia around the base of the jar. Insert a tea light candle. Light and enjoy! I had extra leaves so I decided to use them to make the branch mobile below. Cut the fishing line various lengths. Glue the line to the back of the leaves. Hang your branch in a desired space then loop the leaves around the branch (I hung my branch with Command Hooks and fishing wire). That's it! I hope you enjoyed these DIY's! Let me know if you give them a try! Today I am so happy to be co-hosting with Rachel for her Bloggers Who Inspire Me Linkup! I hope you will link up your recent posts with us below! Meet your guest co-host Jill of Doused In Pink, I just love this fashionista, momma and friend and I know you will too. You can find her links below to follow her and get to know her as well. You can follow Jill the following ways: Instagram, Facebook, Twitter, Pinterest and Bloglovin. I have a few lace tops that I am not sure how to style and carry into the fall season, but Karen brought in several options and ways to do just that from summer to fall. See her looks here, this is just one of them. Jessica linked up a fun way to style a feathered top. I love the textures and patterns she brought into this look to dress the top up. See outfit post here. How lovely is Carly's braid and outfit for fall? I just love it...oh and this was a bad day for her but she still rocks this look and is a good mama regardless. See post here. Christie came up with some lovely ways to style a blanket scarf that I can't wait to try myself. See post here. Amy does a few posts with her daughters where they style similiar clothing and this had to be the cutest. I love their denim on denim on denim outfits. Check out their style and cute adventures here.